Joe Ramirez visited the Diocese of Wichita last month. A statue outside of St. John Nepomucene Church in Pilsen depicting Father Emil Kapaun assisting a wounded soldier was inspired by a story about the parish’s favorite son whose heroism during the Korean War lifted the spirits of his men, saved the lives of many, but ultimately led to his death – and to his consideration for canonization by the Vatican. The statue is a reminder that after Father Kapaun and many of his fellow soldiers were captured, he encountered a struggling wounded soldier and began carrying him while he and other prisoners of war were being marched to a North Korean prisoner of war camp. The story continues, though. Another soldier, a man baptized by Father Kapaun soon after the soldier’s arrival to South Korea, took over carrying that wounded soldier when Father Kapaun tired. 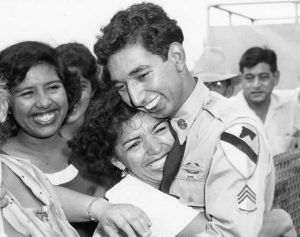 Joe Ramirez hugs his sister upon his return to the U.S. in 1953. 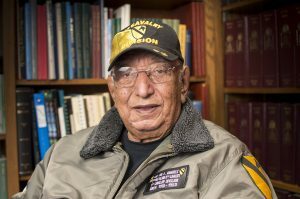 That Army private, 87-year-old Joe Ramirez – now a retired master sergeant – traveled to the Diocese of Wichita last week to visit Father Kapaun’s hometown and to share stories about the priest who was always a saint to the men in the POW camp. Ramirez remembers well the events surrounding his capture. It was Nov. 5, 1950. After a difficult firefight on Halloween night, five days before, he and his platoon were anticipating a night attack. They could hear troops advancing on them but couldn’t yet see them in the dark. Eventually, their lieutenant ordered flares to illuminate the battlefield. “They looked like ants coming at us, thousands of them,” Ramirez said. Ramirez and his fellow soldiers traveled through the mountains for four or five days in an attempt to get back to safety. Instead, they encountered North Korean soldiers and another battle began. Of the 39 in his group, 13 were killed and 12 were wounded before they were surrounded by the enemy. “What do you mean by that,” his fellow soldier said. Moments later a Chinese officer, many of whom spoke excellent English because of their education in the U.S., walked over to the machine gun and kicked the gun and the Korean soldier over. “He told us to put our boots back on,” Ramirez said. During their march to a POW camp, the prisoners were often hidden in sheds, away from U.S. jets looking for targets. On the second day, Ramirez’ group caught up with Father Kapaun, who was carrying a wounded soldier. Ramirez’ commanding officer, Captain William “Moose” McClain, told him to relieve Father Kapaun. “So I took that soldier off his back and I carried him the rest of the way,” he said. Their march ended weeks later at Camp 5, Camp Pyoktong, near the Yalu River, which is the border of northwest North Korea and China. It was a region where the temperature that winter dropped to 50 degrees below zero. The camp’s conditions were horrible, Ramirez said, adding that they spent much of their time killing lice by the thousands, and attempting to survive on a diet of millet, barley, cracked corn, and turnips. Eventually, they built their own latrines and the Chinese camp personnel brought in DDT to kill the lice. He weighed 85 pounds when the camp was liberated. About 1,600 POWs died of disease or starvation from December of 1950 through May of 1951, he said, and were buried by their fellow soldiers by being entombed by rocks because they were unable to dig graves for them in the rocky and frozen ground. Ramirez said he remembers May 23, 1951, the day Father Kapaun died, months after the priest’s health began deteriorating. Ramirez visited the diocese Monday through Friday, March 25-29. In addition to visiting the Father Kapaun Memorial and Museum and St. John Nepomucene Church in Pilsen, spoke to students at St. Elizabeth Ann Seton School, parishioners of St. Francis of Assisi Parish in Wichita, delivered a talk to the student body at Kapaun-Mt. Carmel High School, and to classes at Bishop Carroll in Wichita and St. Mary’s Colgan in Pittsburg. The veteran ended his tour of the diocese by speaking to the Kapaun’s Men group in Pittsburg. Scott Carter, the coordinator of the Father Kapaun Guild, said it was a joy and an honor to welcome Ramirez to Wichita. Carter said Ramirez enjoyed meeting the hundreds of people who came to hear him talk.